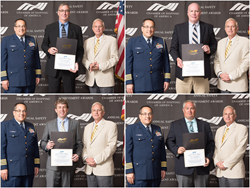 Eighty-two Crowley Maritime Corporation owned or managed vessels recently received the Chamber of Shipping of America (CSA)’s annual Jones F. Devlin Awards in recognition of their outstanding safety records in 2017. Safety is at the top of Crowley’s core values and strategic goals. The vessels receiving Devlin Awards exemplify this Crowley core value, because they live it every day – for themselves, their families and Crowley. CROWLEY MARINE SERVICES 408 Yrs. MARINE TRANSPORT MANAGEMENT 12 Yrs. CROWLEY PUERTO RICO SERVICES 31 Yrs. CROWLEY PETROLEUM SERVICES 66 Yrs. CROWLEY FUELS LLC 24 Yrs. CROWLEY GOVERNMENT SERVICES 43 Yrs. CROWLEY GLOBAL SHIP MANAGEMENT 29 Yrs.